The Sovereign is The Royal Mint’s 22 carat gold flagship coin and has been a constant of British coinage, admired and trusted through times of change. 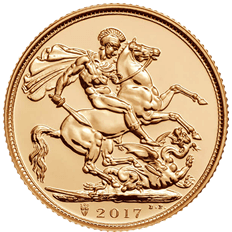 It features Benedetto Pistrucci’s original St George and the dragon design and for 2017 has the addition of a privy mark on the reverse to acknowledge its 200th anniversary. This bullion coin is an investment piece and the weight and quality is verified at the Trial of the Pyx - an exacting independent trial dating back to at least 1282. The exceptional purity of The Sovereign’s 916.7 gold means it is CGT exempt in the United Kingdom and VAT free in the UK and European Community. To preserve your investment, the bullion Sovereign coin is packaged in a single coin capsule and is also available in a 25 coin tube. Being UK legal tender it is VAT free and Capital Gains Tax exempt.